After nearly three months of vigorous training, countless races, and nail-biting finishes, the Chaminade varsity cross country team’s season finally came to a close with the New York State Federation Championship on Saturday, November 19. A week prior, the Flyers had showcased their talent at Van Cortlandt Park when they breezed past their projected finish of sixth in the meet by placing fourth. Not only did this feat send the team to the Federation meet, but it also continued the Flyers’ seemingly annual tradition of competing in this extremely competitive race. 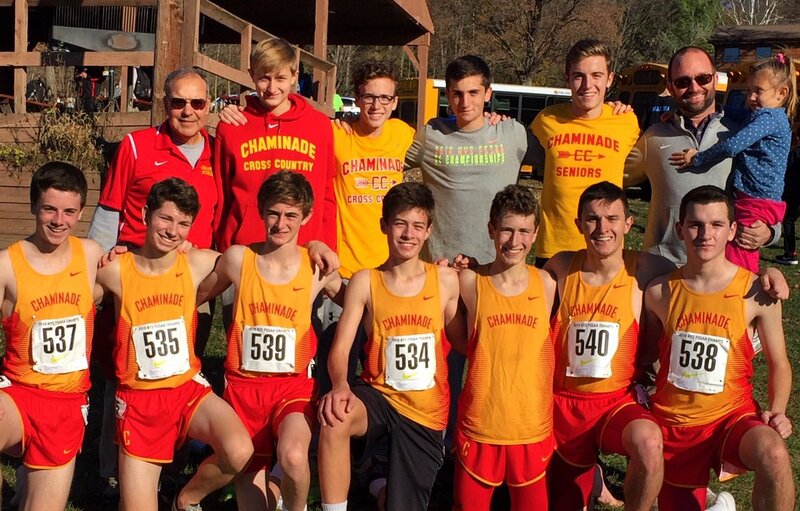 Chaminade’s top seven runners who competed in this race, located at Wappinger Falls, knew the stakes they faced and felt a keen responsibility to ensure that the Crimson and Gold’s presence be felt on the course. With coaches Carriero (back l.) and Beirne (back r.), the cross country team poses for an end-of-season photo. The cross country team, headed by Mr. William Carriero ’69, took the two-hour long journey upstate the night before the race to ensure each runner would be properly prepared for the difficult course known as Bowdoin Park. It was a familiar park to the team — they had raced the course earlier in the season and in years prior — and each member was aware of the difficulties and obstacles it held. The famous five kilometer course is essentially a loop, with almost its entire first half consisting of an uphill run, accompanied by a downhill run in its second half. Taking these circumstances into account for their race strategy, the Flyers were more than prepared to end the season on the right foot. (From left to right): Patrick Conklin ’18, John Phelan ’18, Edward Daubel ’18, Chris Loumeau ’17, Connor Fitzpatrick ’17, James Moran ’18, Chris Strzelinski ’17. Running with that confidence for all 3.1 miles of the course’s long straightaways and hills, the Flyers put on a display of sheer determination and grit as they hustled their way to a phenomenal fifth place finish, crushing last year’s team finish of nineteenth. Conklin led the charge with an outstanding individual performance, finishing twenty-fifth out of nearly two hundred-fifty runners, followed closely by senior Connor Fitzpatrick who impressed as well with a fifty-sixth place finish. Contributing to the team’s success were the efforts of Chris Loumeau ’17, Christopher Strzelinski ’17, and John Phelan ’18, who placed in the top half of all finishers. Chaminade’s overall team finish of fifth place was good enough not only to beat all other Catholic schools in the state, but also to far surpass the expectations that had been set for them, proving that the Flyers are a force with which to be reckoned. Although the Flyers will not be competing in any more races this year, the end to their season was nothing but spectacular. 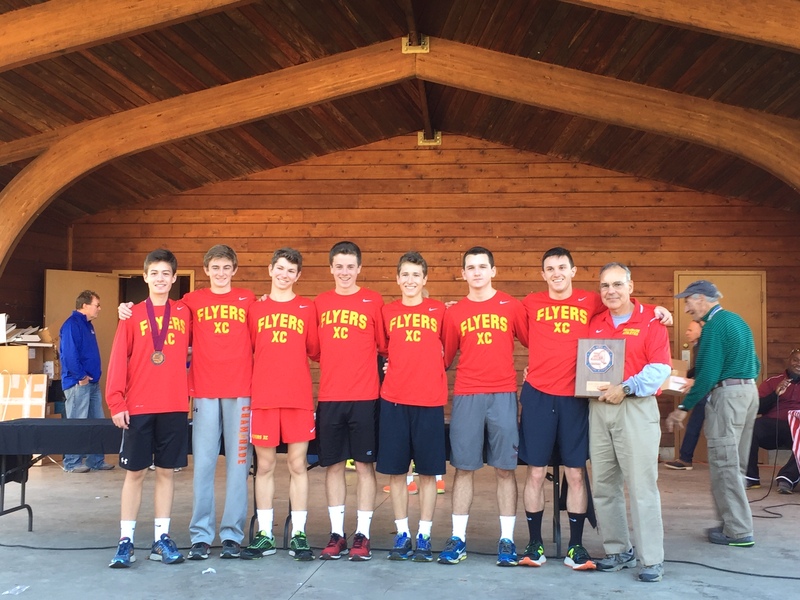 All members of the varsity cross country team had a successful season as individual runners and as a team, and their impressive finish promises that the Flyers’ successes will continue to climb uphill from here. Posted in Sports and tagged cross country. Bookmark the permalink.